A sweet and zesty meal that will transport you to the tropics. Before starting the cooking process it is best to have all items cleaned, cut and measured. For the Rice-Measure rice and rinse thoroughly in a fine mesh colander. Drain well. Heat coconut oil in a medium size frying pan over medium high heat. Add rice and fry stirring frequently, for about 4-5 minutes or until some of the rice grains start to become lightly golden brown. Add coconut milk, broth, lime juice, lime zest and toasted coconut. Bring to a boil on med/high heat. Once boiling lower the flame to lowest setting. Cover with a tightly fitting lid and DO NOT stir. Cook until all broth is absorbed. Cooks for about 17-20 minutes depending on cookware. 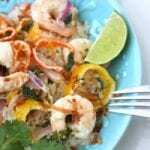 For the Coconut Lime Tequila Shrimp- In a large frying pan heat coconut oil over med/high heat. Once pan is hot, sauté onions until softened, about 2 mins. Add garlic and sauté for another min. Add peppers, stirring frequently continue to cook for another 4-5 mins or until softened. Add tequila, lime juice and lime zest. Cook until liquid is reduced by half. Add cilantro and continue stirring until cilantro is wilted, about 1 to 2 mins. Add shrimp, cook until just starting to turn pink. Once shrimp is slightly pink add coconut cream. Stir well and continue to cook for another 3-4 mins. Remove from heat. Will be a creamy broth when serving over rice. Garnish with toasted coconut and cilantro. If replacing quinoa for the rice, prepare according to instructions but replace the liquids with half coconut milk, half chicken broth and 3 tbsp lime juice.